Countercurrent is collaborating with the Plastic Pick-Up to create a large-scale interactive wave sculpture from over 20,000 golf balls collected from the ocean. We will fabricate the sculpture from steel and assemble it securely on a 26ft flatbed trailer for easy transport to events around the country. Our goal is to use marine debris golf balls as a conversation starter to engage viewers in a broader dialogue around personal/corporate responsibility to combat ocean plastic pollution. 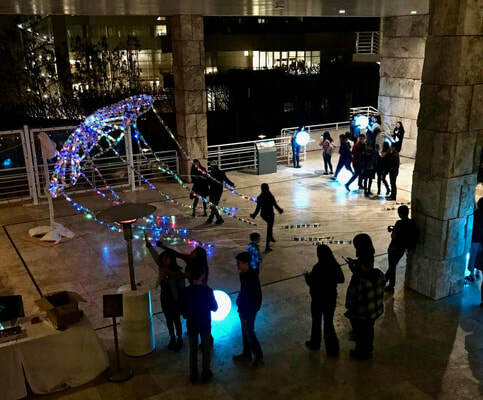 Countercurrent received a grant from the J. Paul Getty Trust to build a large-scale interactive sculpture during the College Night 2018 event at the Getty Museum. Thousands of college students experienced our giant bioluminescent jellyfish sculpture made from over 800 single-use plastic water bottles. ​The Earth Day March for Science represented an unprecedented awakening of collective environmental consciousness. Countercurrent founder Ethan Estess travelled to Washington DC for the March for Science with a camera and an open mind. By documenting this moment in time, Countercurrent hoped to create a valuable record of individual concerns within the environmental movement in 2017. Countercurrent’s Art+Science Workshops are designed to engage underserved high school age youths in Watsonville, CA in issues of ocean sustainability through the collaborative design and fabrication of public environmental art installations. Youth participants were exposed to cutting edge ocean science being conducted in the Monterey Bay, followed by hands-on sculpture training by Countercurrent Director and Participating Artist Ethan Estess.